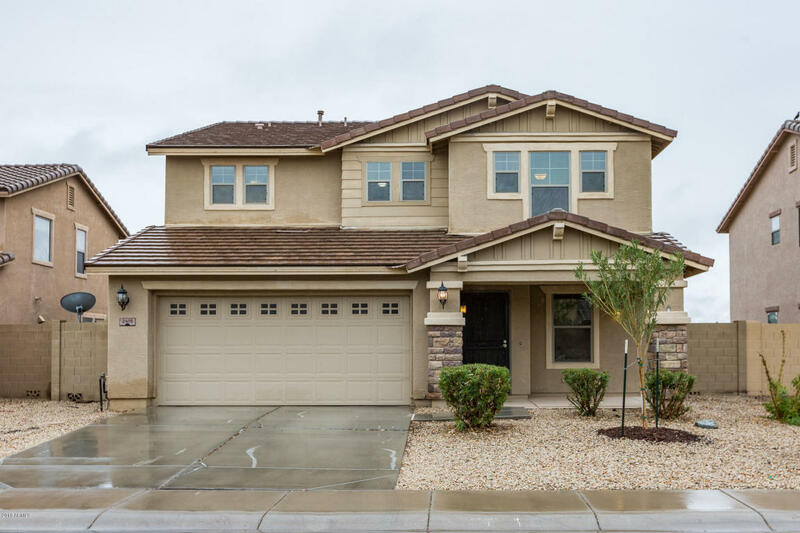 Spacious family home offering 5 bedrooms & 2.5 baths in 2577 SqFt. Separate living/dining rooms and eat-in kitchen that opens to the family room. The kitchen has oak cabinetry, granite counters, stainless appliances & island with breakfast bar. French doors lead out to a huge backyard with a refreshing pool, pergola-covered patio with counter seating, artificial turf for kids & pets to play on & covered patio. Bedrooms & a built-in homework station are upstairs. The roomy master retreat has a private bath with double sinks, separate tub & shower & TWO walk-in closets. Other features: 2 car garage with cabinets & service door, large laundry room, wood laminate flooring, powder room for guests & great community water park, playgrounds & more! See today!